Imagine if Florida was cut in half....It almost happened. From Waterway to Greenway is the definitive history of the Cross Florida Barge Canal, told by the people who were there. A Documentary by Darren Preston Lane. Bio - Darren was born in Boynton Beach, Florida and has been involved in TV/Film Productions for more than 20 years. He relocated to Gainesville to attend the University of Florida, College of Journalism. 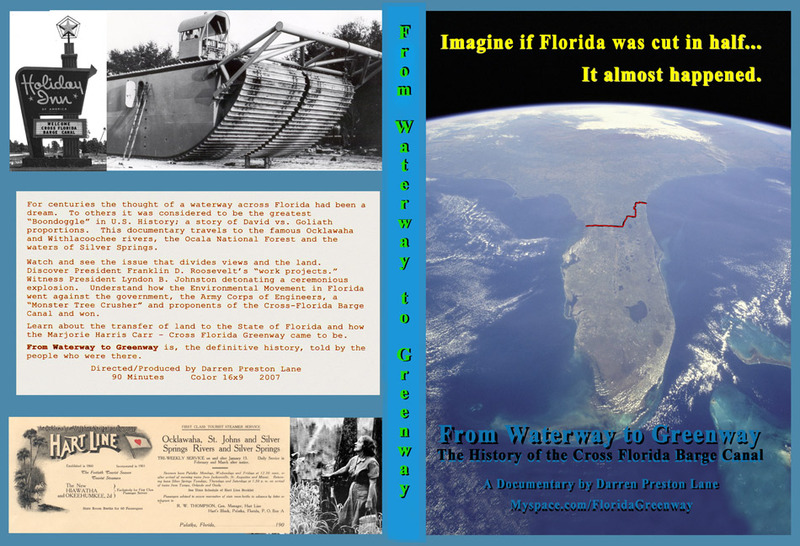 He has produced two Florida feature-length documentaries, “Hurricane Andrew: A Retrospective” and “From Waterway to Greenway: The History of the Cross-Florida Barge Canal.” Darren enjoys topics that relate to the environment and continues to pitch issues that are close to him to a national/international level. His work has been featured in a variety of TV/Films and on The Discovery Channel, History Channel, Speed Channel, Court TV and Animal Planet. Darren has spent most of his life in Florida and has traveled the world taking photographs and living a life of adventure. He is an avid Scuba diver and Skydiver. He maintains a residence in North Central Florida and free-lances as a videographer.